The iPad 3 is here! Time to buy iPad 2s for reviews! With the release of the new iPad, you can now get the old iPad2 for as little as $400. For those of you who have heard me speak, you know I suggest getting iPads to have in your office so that patients can use them to “like” your Facebook page and post on your wall, and also do a photo or video that you can use for your website as well as social media. If you haven’t done it, now is the time, because you don’t need iPad 3s. All you want is the most basic iPad 2, with just WiFi, because it will still do everything, and now it’s cheaper than ever. This falls into the category of making things as easy as possible to get the most results. If you want a few reviews, ask people to do them when they get home. 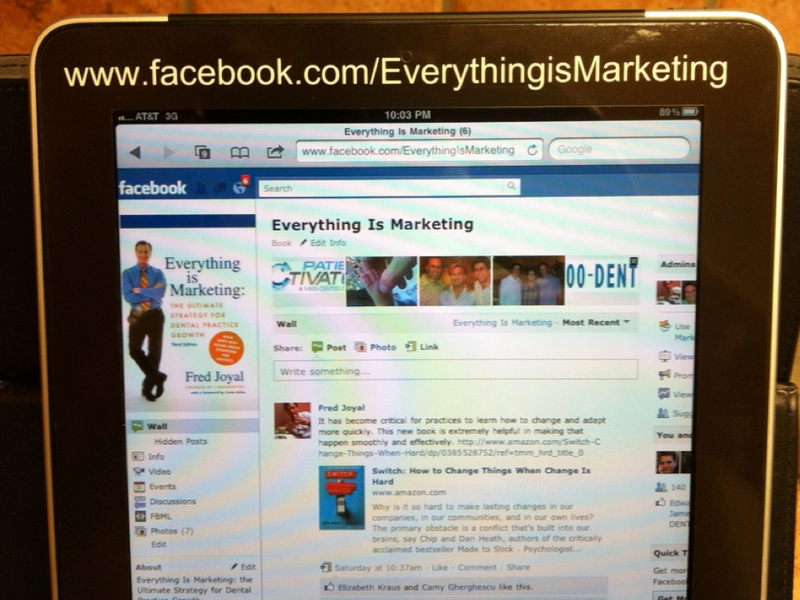 If you want tons of reviews, “likes” and posts on Facebook, get some iPads. And once get them, go to www.skinit.com and buy adhesive covers so that you can put your Facebook username right on the front (like I did here for my book page). Also put your Yelp address on the bottom, and if your patients do Yelp reviews they can post something nice there as well. Remember, you don’t want them doing Google reviews from the iPad. Google disregards multiple reviews that come from the same device. Ask them to do it on their phone. They can find the office on a Google map and log in (if they have a gmail address) and review your practice. The extra added benefit is people will see you as a modern, high tech practice. That’s a good thing. This entry was posted in Dental Marketing, Dentistry, Online Reviews, Patient Loyalty Tips, Practice Management, Social Media, Websites and tagged advertising, dental marketing, dental practice management, Facebook, Online Reviews, social media, websites by Fred Joyal. Bookmark the permalink. Will Yelp not disregard reviews coming from the same IP address? They must have the technology to figure it out. They definitely discourage solicited reviews. I corresponded with a tech helping me with the IPAD app….who stated so. I believe they threatened to take them down if they determined they were not genuine unsolicited reviews. I didn’t ask in my emails for clarification for fear of being flagged or something. There seems to be mixed opinions on that. You have to log in as a Yelp reviewer, and people can have multiple users on their home computers and it works fine. Yelp of course has all sorts of secret rules about what reviews show up and what doesn’t. If the person reviews you they don’t have any way of knowing if it’s solicited or not, unless somewhere on the internet you’re offering to reward people for that, and I don’t think they’re searching for that everywhere. You could always err on the side of caution and ask them to do it on their phones, but I’m not as concerned about it as I am with Google reviews, as I know they will disregard multiple reviews from the same ip address. We wanna you review our app… Search DCStory in apple app store.. If you interested in this, contact us.. Brilliant! Thanks for the great tip!